The Reekoh team are thrilled to have been recognised across a number of recent IoT and IT industry award categories recently. It’s been not only rewarding to the team for their hard work and efforts in building and commercialising a new product, but also beneficial to elevating the Reekoh message and offering in a market that has proved to be in a crowded and confusing state. 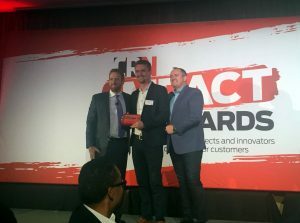 The CRN Impact Awards have typically focused on the IT channel, resellers, and the projects that these system integrators and vendors deliver to the market. This year, the awards included a number of new categories focused on new IP and products being developed and delivered through the channel, by emerging and established startups and technology companies. Reekoh was the winner of the Emerging Innovator Award for, as told by one of the judges, addressing the “huge problem of fragmentation and integration in the IoT space”. As we also have a go-to-market strategy that works through channel partners, Reekoh was also seen as a company developing the next generation of products and services that the traditional CRN audience would be engaging with in the near future. You can read more about Reekoh and the CRN Impact Awards here. 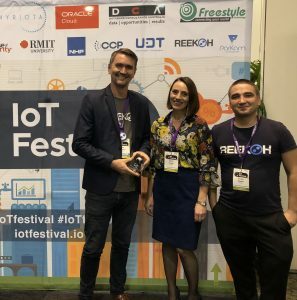 Part of the annual IoT Festival in Melbourne, the Australian IoT Awards are produced by IoTHub.com.au and look at successful IoT projects from Australian vendors, and this year included a product category as well. IoT Hub is a leading source of local IoT news and it was great to see them link with the IoT Festival for the awards this year, given the ongoing success of the event. Reekoh was awarded Best IoT Platform or Product, in a category filled with fantastic companies and products such as Clarinox, ECConnect and Leash IT. For us, this was welcome validation of how we’re going about taking our platform to market and how the integration capability we’re promoting is connecting with customers. You can read more about the Australian IoT Awards here. Thank you to all of the judges, our customer, partners, and of course our collective team in Australia and Manila, for your recognition, support and commitment to Reekoh. We can’t wait to see what the rest of this year brings.